There is a new Holy Grail of Rare Video Games, and it is Stadium Events. The auction on a factory-sealed NTSC version closed just minutes ago, and it was sold for $41,300, almost double the old record. Three days into the bidding the high offer had already eclipsed the record price ever paid for a rare game - $20,100 for a Nintendo Campus Challenge cartridge sold last fall by Denver entrepreneur J.J. Hendricks, who earlier in 2009 also paid $17,500 for a gold Nintendo World Championships cart. "I was pretty amazed at the price," Hendricks told Kotaku. "This Stadium Events auction destroys the previous record and I think is a surprise to everyone in game collecting community. I just wish there was such a thing as a sealed Nintendo World Championships Gold." Hendricks said he did not bid on the sealed Stadium Events box. "I thought about it briefly but the bidding quickly went beyond what I was willing to pay," he said. "I'm not that into sealed game collecting." Bidding surged in the final 18 hours of the Stadium Events auction, nearly doubling the price from $22,500 to its final amount. Much of that was attributable to a single user bidding it up unopposed 35 times in a 10-minute span early this morning - from $22,700 to $39,800 - before leaving the auction. In all, more than 100 bids were placed on the item. Hendricks thinks that the price paid for this Stadium Events, plus the $13,105 paid for an unsealed, used version sold two weeks ago by a woman in Haw River, N.C., has "caused a huge spike in interest in game collecting." Hendricks said that traffic to his site, VideoGamePriceCharts.com, where he's compiled an updated list of the most expensive used NES games ever sold. has seen a corresponding surge. "It almost doubled the week after the first Stadium Events auction," Hendricks said. 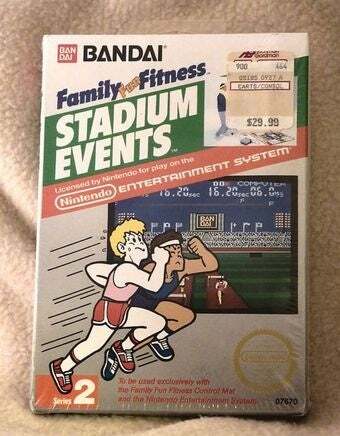 The NTSC version of Stadium Events is believed to be one of the rarest games ever; fewer than 20 copies of the game, only one of them factory-sealed, were known to have existed before last week's auction began. Its rarity is owed to the fact the rights to it and its dedicated controller, what later became the Nintendo Power Pad, changed hands to Nintendo soon after its limited 1987 release in North America. Hendricks' World Championships Cart was one of 26 prizes given out during a 1990 promotion by Nintendo Power magazine. The Campus Challenge cart is the only original copy in the world known to exist. Interestingly, Hendricks points out that another copy of Stadium Events - apparently factory sealed in its listing photo, but not described as such in the headline - is currently selling for far less. The latest bid on this version was $7,300 with a little less than three days remaining.